Much mythology has surrounded Hongi Hika, the famous rangatira and general of the musket wars. History records that he received a gift of armour from King George IV in 1820. During his part in the musket wars he wore the armour, which successfully deflected musket fire during battle. In 1827 he received a fatal wound when, for some reason, he decided not to wear the chain mail. He died the following year from the wound. 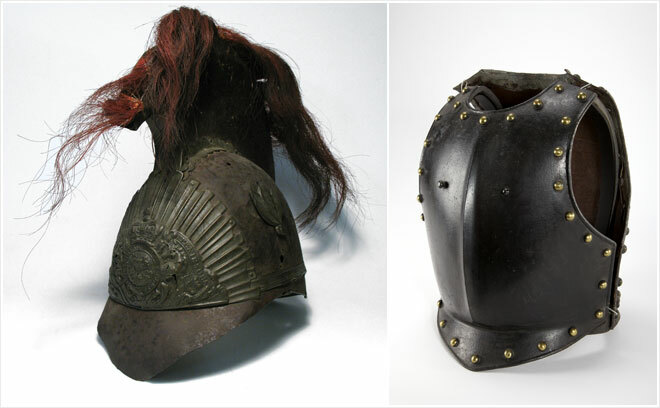 The early-19th-century cavalry armour shown, consisting of a helmet (with a Roman-style crest and red horsehair), breastplate and back plate, is held in the Auckland War Memorial Museum. It was originally thought to belong to Hongi, but research has confirmed it was not his. Armour gifted to the Dominion Museum (now Te Papa) in 1908 by Māui Pōmare was also initially said to have belonged to Hongi Hika, but is now thought to have been owned by Ngāpuhi chief Tītore. In fact, Hongi Hika's armour was chain mail, so neither of these suits could have belonged to him. It is likely that their attribution to him is related to his near-folk-hero status in wearing armour to ward off bullets, not unlike Australian folk hero Ned Kelly who would try the same trick half a century later. It is not known what happened to Hongi Hika's armour.